Last week's Monday Pearl highlighted the Office of Second Vice Grand Basileus. Included in the communication was a list of the brothers who occupied said office. Included in the list was Brother J. Heyward Harrison from Pi Chapter at Morgan State College in Baltimore, MD (understood by most to be organized in the Second District). Please note that Brother Harrison was included in the Third District 2VGB list because when he served in 1953, Pi Chapter was organized in the Third District. In 1955, Pi Chapter was reorganized into the Second District. The History and Archives Committee understands that Bro. Harrison went on to serve as a proud and longtime member of the Second District and was a loyal Son of Omega. This week's Monday Pearl is a precursor to a project underway by the Committee to produce biographies featuring the only two men to hold the Office of Grand Basileus from the Third District (since the formation of districts): 18th Grand Basileus Campbell Carrington Johnson (1945-47) and 19th Grand Basileus Harry Theodore Penn (1947-49). The Committee has also included an interesting and somewhat related report of the 1946 Redistrictricting Committee that appeared in the March 1947 Oracle. Please read  to the end. 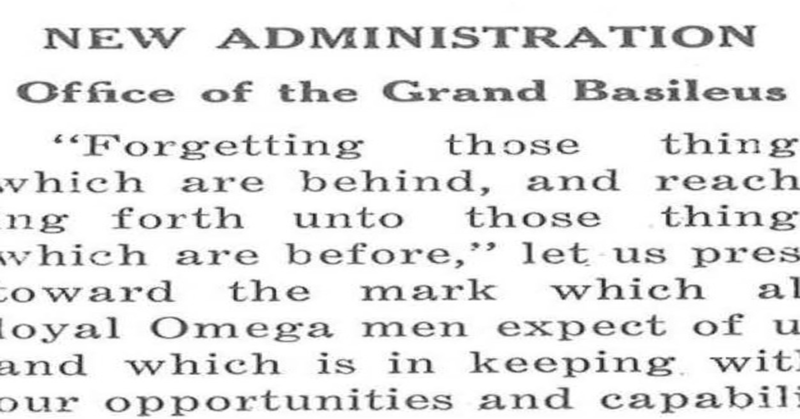 It is encouraging to know that current and former Grands Dan Jones and Mark Jackson, Walter H. Riddick, Charles Chambliss, Kenneth Brown, Robert Fairchild, and Curtis Baylor have earned the confidence of the brotherhood and ascended to top leadership despite the historically challenging voting delegate landscape. Do something for somebody this week Brothers. The Monday Pearl is provided by the Third District History and Archives Committee and is a weekly sharing of fraternity content, commentary, and research of historical value we hope Brothers will enjoy and from which Brothers will draw inspiration. The Committee encourages your feedback. Should you have reactions, comments, information, anecdotes, documents, and the like, related to any of the content we share, we'd very much like to hear from you. Please send all communication to 3dhistoryandarchives@gmail.com. Third District History and Archives Monday Pearl 3/4/19 – Oh Nellie!